STOCK PHOTO: Behind 43 combined points from Braden Bockway and Shiloah Blevins, South Webster bounced back in a big way Friday evening. WAVERLY — After a loss to Fairland this past week, South Webster needed something to get itself back on track. Turns out, a trip to Waverly was just what the doctor ordered. Behind 43 combined points from Braden Bockway and Shiloah Blevins, the Jeeps earned a 75-65 win over the Tigers on the road … but it took an extra four-minute quarter to do so. One of those shooters goes by the name of Trey Robertson and get used to hearing his name. With just three seconds left in regulation and down 63-60, Robertson, a freshman, dialed long distance to force overtime in a 63-63 deadlock. The Jeeps (2-1, 1-0 SOC II) looked stunned. However, Cole had a message for his team in between the end of the fourth and the start of OT. As soon as the extra four-minute time period commenced, South Webster took advantage of Waverly’s multiple miscues. It led to a 12-2 game-ending run. “We made shots tonight and you look good on offense when you make shots,” Cole said. That effort was certainly led by Bockway and Blevins. Bockway hit six — count ‘em — 3-point field goals en route to a game-high 22 points alongside 10 rebounds. Meanwhile, his running buddy Blevins, scored 21 points and grabbed nine boards. Waverly took the first lead of the night when Cobe Marquez connected with nylon at the 7:25 mark in the first. That lead wouldn’t be surrendered until the 4:49 mark in the third quarter when Bockway hit back-to-back 3’s to give the Jeeps their first advantage of the night at 39-36. 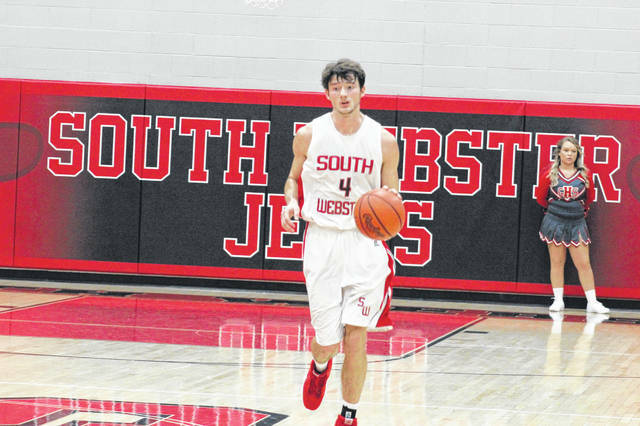 South Webster then enjoyed an edge until Roberton’s game-tying shot late in the fourth. After Bockway and Blevins, sophomore Tanner Voiers added 16 points while Andrew Smith tacked on nine. Trae Zimmerman also helped out, scoring four points alongside a team-high five assists. For the Tigers, Robertson led the way with 16 points and four assists while Cody Remington followed with 13 point and a team-high nine rebounds. Easton Wolf and Ethan Dunn also hit double-digit scoring figures with 10 points apiece. The Jeeps will try and keep the momentum going Tuesday, hosting Valley, while Waverly attempts to bounce back on a trip to Northwest. South Webster: 24-40 FG, 17-23 FT, 10-18 3pt. (Bockway 6), 30 rebounds (Bockway 10), 21 turnovers, 13 assists (Zimmerman 5). Scoring: Bockway 22, Blevins 21, Voiers 16, Smith 9, Zimmerman 4, Ruth 2, Holstein 1. Waverly: 26-63 FG, 4-7 FT, 9-27 3pt. (Robertson 4), 26 rebounds (Remington 9), 16 turnovers, 11 assists (Robertson 4). Scoring: Robertson 16, Remington 13, Dunn 10, Wolf 10, Marquez 9, Smallwood 6, Shoemaker 1.